Paul Parish Church contains a wooden screen upon which are various Arms. Unfortunately, during my very quick visit I did not find any details. The Arms above are probably for a descendant of Simon Bolitho (b.1695 d.1787) who married Mary, daughter and heir of Edward Borlase, by Prudence, daughter and heir of Peter Trevelyan, of Basell, in Cornwall. 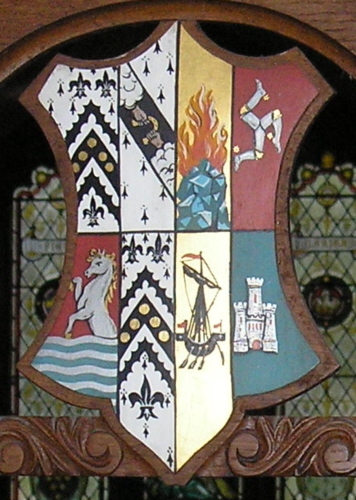 The Arms are those of Lt Col William Edward Thomas Bolitho DSO [Burke’s landed Gentry – Bolitho of Trengwainton] and Ethel Grace MacLeod, daughter of Robert Bruce AEnaeas MacLeod of Cadboll. He was only surviving son of William Bolitho of Polwithen and Mary Hichens Yonge, daughter and co-heir of William Yonge. Colonel Bolitho died in 1919¹ having resigned command of the 2/1st Royal Devon Yeomanry in 1918 because of bad health. Both his sons pre-deceased him, Lt William Torquill MacLeod Bolitho was killed in action in 1915 aged 22. He left a daughter, Brenda Grace. ¹ Col Bolitho’s effects were valued at £176,114 6s 8d for Probate in 1919. It implies that the whole sinister side of the shield is Macleod of Cadboll, and that the first quarter is Macleod of Lewes. I have no opinion either way, but thought you may be interested.